What do you cook when you are alone at home and just have to cook for yourself? With my HD away on business trip for one full week, I spent first two days by eating all left over and took dry sandwich for lunch box. When there was nothing left in fridge, I went for frozen Parathas and canned curries and takeaways. It went on like this for next two days and the time came for me to move my a*&$% to kitchen when my tummy went on strike for torturing it and wouldn’t listen to any of my poor excuses for not in a mood to cook for myself. Ha, what was I thinking? I could enjoy one week of bachelor life without cooking, washing the dish and spending the evening with my favourite book and TV shows? Tough luck!!! Thankfully there was someone who came to my rescue. My true knight in shining armour. The one only dark, handsome and pot bellied Baby Brinjals (what did you think? Tsk tsk… Dirty minds ;). I usually go for stuffing them with spice mix when ever I get these lovely purple beauties. This time around I neither had time nor energy (read to lazy to cook) to do it. So I went for next best thing, stir fried them. Now came the question of what spices to add, do I need to use onions and tomatoes, etc etc… Sometime you can become quite creative when you are too lazy to do anything and the best example is my own creation of this Masala Badane Palya. Just roasted few lentils and spices and ground them with small bunch of coriander and chillies and added them to stir fried Brinjal wedges. And voila!!! A winner recipe was ready in no time at all… It tasted simply amazing (to my own surprise ;) with steaming bowl of Rice with chilled Yogurt and this lovely Yellow Watermelon to complete the dish. 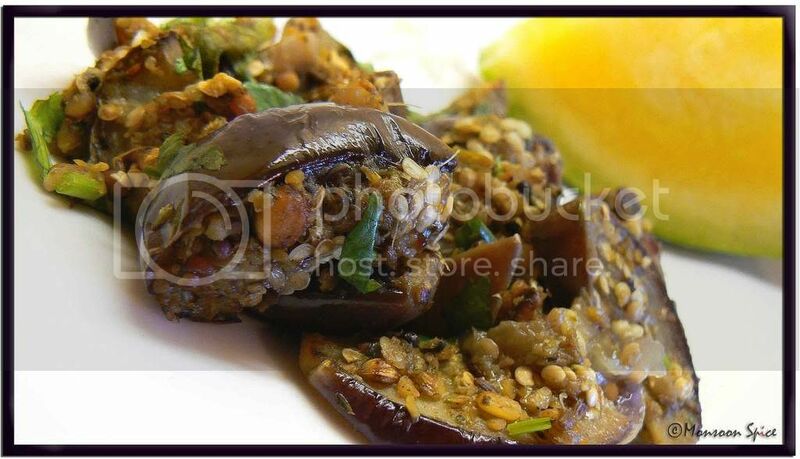 I can highly recommend this recipe for all you Brinjal/eggplant lovers. 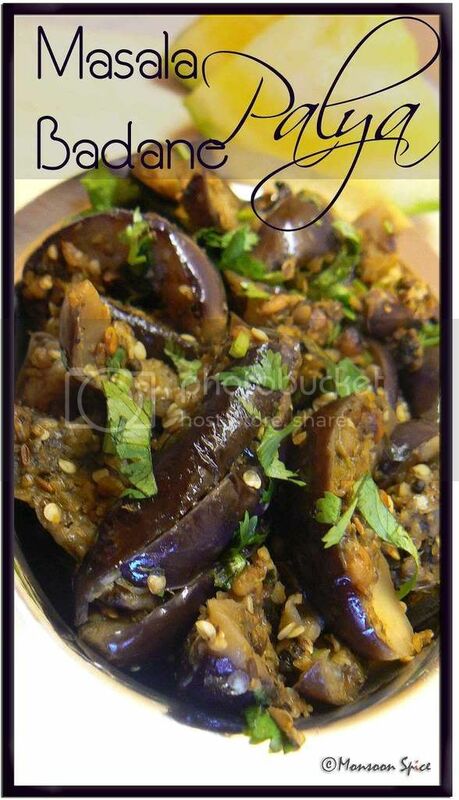 If you don’t have baby purple brinjals use the regular eggplants and follow the recipe. 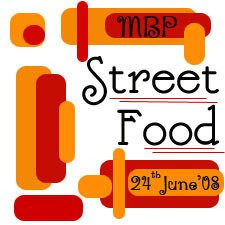 Off it goes to Sangeeth’s Eat Healthy-Fibre Rich event after I read it here and here that Eggplant is indeed high in fibre and good for weight reduction (how cool is that, more reason to eat eggplant;). And not to forget all those channa and urad dal which too are rich in fibre. Dry roast channa dal in a pan till it turns light golden brown. Similarly dry roast urad dal, coriander seeds and jeera one by one and keep them aside to cool. Once cooled grind them coarsely with fresh coriander leaves, green chillies, ginger and tamarind pulp without adding any water. Now heat a tbsp of oil in a pan and add mustard seeds to it. When it starts to pop and splutter add channa dal, urad dal, and dry red chilli. Sauté them on medium flame till dals turn golden brown in colour. Mix in cumin seeds, curry leaves and hing and sauté for just few seconds. Add brinjal wedges and keep stirring at medium to high flame for about 5-8 minutes. Add salt to taste and ground powder and mix well. Keep stirring for another 2-3 minutes till all pieces of brinjal is nicely quoted with ground mixture. Sprinkle 1-2 tbsp of water and cover the lid. Let the brinjals cook on a low to medium flame for another 10-15 minutes. Sprinkle little water in between to making sure that the masala doesn’t stick to the pan. Switch off the flame once the brinjals are well cooked and mix in finely chopped coriander leaves. Serve it with a bowl of steam cooked Rice with Ghee and Dal or with Chapatti and enjoy. But I am alone weekdays from 8am to 4pm, so I do cook for one sometimes, usually eat leftovers for lunch. Masale Badane palya looks fab, that's how I like it too. I made Ranji's Thambale pudi and added that to Badanekai,it was yummy. So you are alone now for a week, huh? Be safe. Enjoy your weekend, cook whatever you like, K don't like! Great opportunity now! HeHe! Well when my hubby is away i used to cook less as possible, but not shyama has grown up i can't do that any more. I love anything with brinjals/eggplants. This is an awesome dish; we followed something similar from sailus food and it was heavenly delicious. Love your layout! new kya? Where do you get the time to play with it and all. Believe it or not, I was never home alone till now. The eggplant curry looks awesome. Delicious recipe Sia! You soooo love your eggplant dont you?!! u can find them easily in any asian stores. these days u can find them even in tesco as they have started selling some indian greens and veggies like dudhi, bhindi, plantain, baby brinjals, kolahbri, methi leaves, palak etc. i know some ppl r having prob with their posts showing up at TOI. got to leave mesg to sailu. 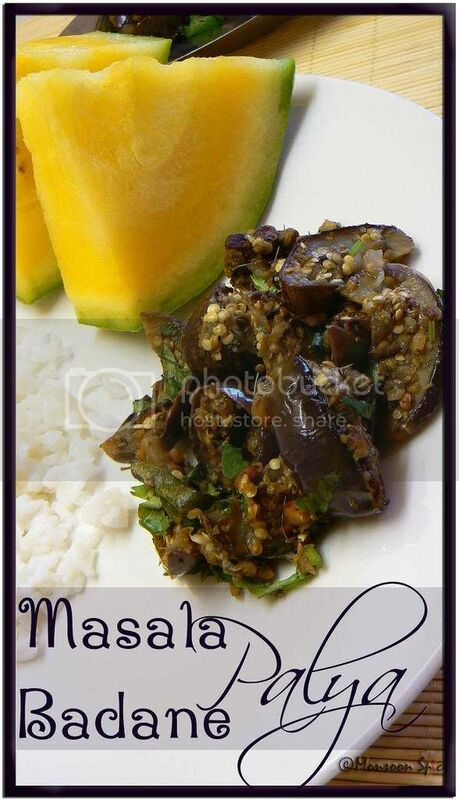 Looks yummy - love baby brinjals, dont they just add heaps of texture and flavour to everything? Usually I appoint N as my sous-chef so he gets to do all the glorious cleaning. Tee hee hee. U wont beleive me.. i was talking to my jusband very seriously and the picture of the purple beauties have left me speechless for a minute. They look soooooooo nice and perfect. love baby eggplant! what awesome photos.